Once upon a time, I saw this sweater on a cute Swedish blogger. I had no idea where it came from so I saved a picture of it so that I could knit it and I spent some time flipping through my stitchionary picking out cables. I went home to my parents, planning on buying green worsted weight from my LYS. Before I went to the LYS, I made a visit our local H&M and what do I see on sale? The sweater. What are the odds? My Dad bought it for me for my birthday. I love it. 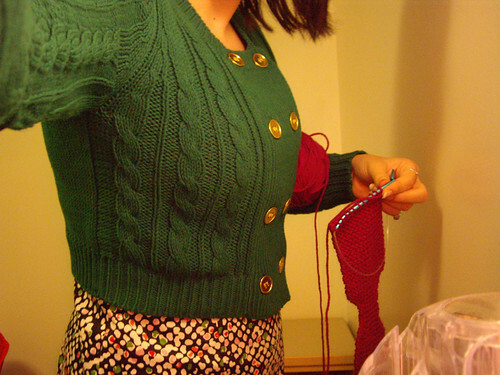 I might still knit my own version of it in a different color with a bigger variety of cables. I like this picture. I took it on accident when I was setting my timer.